Style GC2268 is a cylinder arm walking foot (triple transport) machine that uses a large capacity vertical hook and is designed with modern, contemporary styling. It features a sliding lever thread take up, a dial type stitch regulator and an inside belt to drive the top shaft and hook shaft at ample speed. A high presser foot lift and long stitch length make it useful in the manufacture of heavy duty luggage, soft sided bags, seat cushions and binding operations on luggage, tote bags and similar articles. Identical Feed System to the JUKI LS341, SEIKO LCW8B & SINGER 153B. In fact many parts are interchangeable with the above machines. This cylinder arm lockstitch is ideal for circular items such as Hats, Luggage, Holdalls, Filters etc. 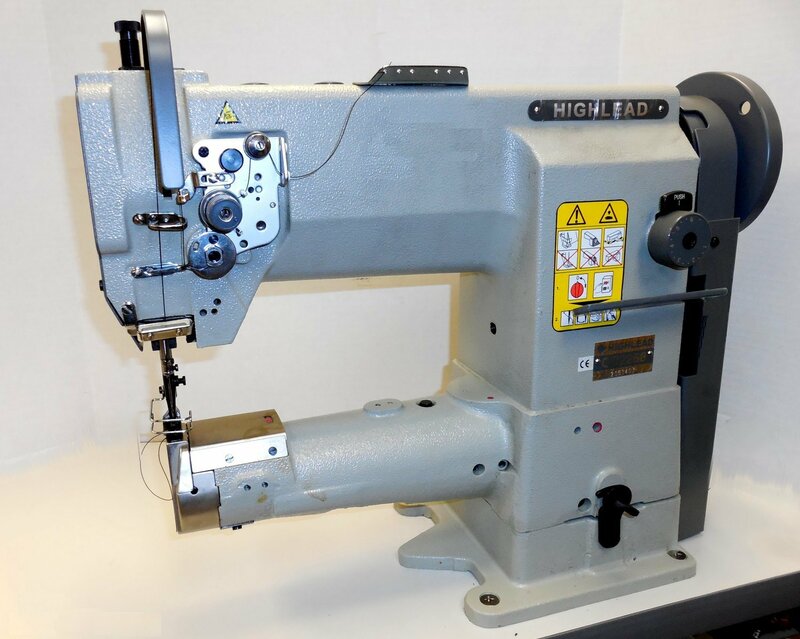 Highlead GC2268 compound feed, cylinder arm, heavy duty sewing machine (bottom feed, needle feed and walking foot feed) with large Vertical axis hook & base. Its powerful and steady feeding action enables you to sew multiple ply of medium to heavy weight material with a true and even stitch. The GC2268 features a 71mm diameter heavy duty cylinder arm shape for use in production of 3 dimensional items. For example: general leather products, bags, luggage, filters, seats, straps, technical textiles, upholstery and wherever you need a cylinder arm shape. The large vertical hook and bobbin offers twice the normal thread capacity, reducing bobbin change over and idea for use with thicker threads. The presser foot has a high lift of up-to 14mm, allowing for a large range of medium and heavy weight materials to be used. An improved safety clutch is fitted as standard to help prevent damage to the hooks, gears and other important parts, should the machine become jammed or over-loaded.